Nurse anesthetists have roots that go as far back as the 1860s when they administered anesthesia to wounded soldiers during the Civil War. A Certified Registered Nurse Anesthetist (CRNA) has the very important role of providing anesthesia to a patient about to undergo surgery. Certification for the occupation of nurse anesthetist has been a requirement since 1945. To practice as a nurse anesthetist anywhere in the United States, passing the CRNA national examination is compulsory. Have a current and unrestricted license as a professional Registered Nurse (RN). Nurse Anesthesia Educational Programs within two years of taking the examination. Submit an examination application form. Submit an official transcript of performance in an accredited nurse anesthesia educational program. Submit a digitalized photo, taken within six months of the examination date, along with a signed authentication of the applicant’s identity form. Never have had a license revoked, restricted, suspended, or limited by any state. The license must never have been surrendered and it cannot be the subject of a pending action or investigation. Not currently suffering from a mental or physical condition that might interfere with the practice of nurse anesthesia. Not currently suffering from drug or alcohol addiction or abuse. Never convicted of or currently under indictment for any felony. Never been the subject of any documented allegations of misconduct, incompetent practice, or unethical behavior. Never been the subject of a disciplinary action, has never been placed on probation, suspended, or dismissed from a nurse anesthesia educational program for unethical behavior, questions of academic integrity, or documented evidence of cheating. Sign a waiver of liability and agreement of authorization, confidentiality, and nondisclosure statement. 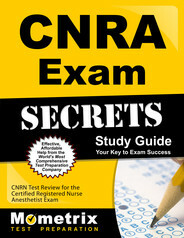 Ace the CRNA test using our CRNA exam study guide with practice questions. 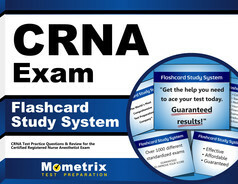 Quickly Solve Difficult CRNA Test Questions with the CRNA Flashcard Study System.